Details have been changed or omitted to protect identities. The title and the text below, has been copied from an article in the Examiner newspaper today, Saturday the 6th of July 2013. Paramedics are eagerly awaiting the outcome of the hearing. We are paid well below the ACT and SA Ambulance services and when compared to other health professionals, who don't make life and death decisions, we are very poorly paid. Snr Librarian $93,900 - What the.... Life and death there. A LANDMARK case on paramedic wages, which could cost the state government millions of dollars, gets under way next week. The state's 270 ambulance officers have applied to be paid as professionals - a move that would result in a 25 per cent pay rise or a $9000 increase on the base salary of $53,064. The Tasmanian Industrial Commission will carry out site inspections next week before the trial starts the following week. Health and Community Services Union assistant secretary Tim Jacobson said it was the first assessment of the work value of paramedics in more than 20 years. "We're saying that the work now, as opposed to what it was in '89, has changed and should be assessed as professional," he said. South Australia and the ACT have already acknowledged paramedics as professional. "We train our paramedics in Tasmania very well," Mr Jacobson said. "They are sought after not only in Australia but overseas, so we need to remain competitive." At the same time, negotiations will start between the Health and Community Services Union over annual wage increases. The agreement expired in June 2012. The union is seeking a pay increase of 2.5 per cent over three years. Mr Jacobson said the request was modest because of the case before the commission and the fact that ambulance officers had not yet been subject to the wages cap of 2 per cent, plus 0.5 for productivity gains. Their previous agreement was negotiated before the introduction of the cap in 2011. Today the Union lodged a Professional Rates case with the Tasmanian Industrial Commission. PARAMEDICS in Tasmania want to be recognised as professionals in an industrial test case that could cost the state government millions of dollars. The Health and Community Services Union has lodged a claim on behalf of the state's 270 full-time equivalent paramedics that seeks professional status for the job and a 17 per cent pay increase to reflect that. For a paramedic starting at the base level of $53,064, that would equate to a $9000 jump in pay. It will be the first time in more than 20 years that the Tasmanian Industrial Commission has been asked to consider the work values of a paramedic. HACSU acting state secretary Tim Jacobson said that over that time the demands, training and responsibilities of a paramedic had changed remarkably. "The work of paramedics is now central to the work that's provided in the health system in general," Mr Jacobson said. "No longer is it simply about transporting people. They are professionals and should be recognised as such. "The sooner you treat people in terms of emergency medical conditions, the shorter the length of stay in hospital and the better the life outcome for that patient." The commission could take months to consider the complex case that's been brought against the cash-strapped Tasmanian government, and whether it will order a reclassification. Premier Lara Giddings has restricted all public sector workers to a 2.5 per cent pay rise when it comes to workplace bargaining in order to make considerable budget savings. Similar cases lodged in South Australia and the Australian Capital Territory over the past few years resulted in pay increases of 20 to 25 per cent for paramedics in those places. Mr Jacobson said other states were also likely to follow suit. "Increasingly what we're finding is, given the special nature of their work, paramedicine is becoming a more mobile profession just like nursing and allied health professionals," he said. "So in order for us to maintain our presence and certainly our ability to attract and retain people we're going to have to continue to pay what the market demands." The union will ask the commission to assess Tasmanian paramedics against their interstate counterparts, as well as nurses and allied health professionals. The base salary for a Tasmanian nurse is $56,135. So there it is, til then, be safe. The Premier of Tasmania announced a couple of days ago that Ambulance Tasmania was looking to hire on 11 more paramedics. These qualified staff are required to replace volunteers at a couple of stations where the workload is too high to expect the volunteers to continue provide assistance to the branch station officer. This is the link to the jobs. Applications close on Friday the 7th of September 2012. The press release also states that Graduates and Intensive Care Paramedics are encouraged to apply. This is the video from a new story on the ABC News tonight and the text from the same story on the abc.com.au website. Tasmania's Ambulance Service is under fire, accused of failing to provide enough staff to meet demand across the state. Staff shortages caused the Bridgewater station in the state's south to close its doors last weekend. The station was left unattended and on-call paramedics had to take vehicles home in case of an emergency call out. The Health and Community Services Union claims similar incidents are frequent and have been for years because of staff shortages. The Brighton mayor, Tony Foster, says the Bridgewater station needs two full-time paramedics. "That's what we need to be able to, I guess, look after the community needs from here to Oatlands and we all know about the Midland Highway," he said. "So we need to be able to go to an accident that may happen on the Midland Highway from Bridgewater, not from Glenorchy, and not from anywhere else." The Ambulance Service is assessing staffing levels and infrastructure. CEO Dominic Morgan says it plans to seek Government funding for additional resources over the next few years. "Ambulance Tasmania has a significant number of strategies in place to take us in to the future," he said. "We've just started five qualified staff, they'll be hitting the roads within the next two weeks. "We've got another three coming on board between now and January and we have 17 officers who will graduate by December," he said. Well it's that time of year, again. Ambulance Tasmania is advertising for Paramedic Intern's (Multiple State-wide Vacancies). The positions commence in February 2011 in the 18 month Graduate Program. And I saw it in todays local paper, so it would be in all 3 Tasmanaian newspapers and I'd suggest many interstate newspapers. Claims have surfaced of ambulance officers being paid overtime to work during their annual leave to cover staff shortages, to the anger of the Liberal Party. More paramedics and volunteer ambulance officers yesterday contacted the Mercury following a series of reports of disgruntled workers fed up with understaffing, not being properly equipped and having to cope with a massive 50 per cent increase in demand over the past five years. And there have been reports of patients dying because ambulances have not been able to get to them in time -- and some staff being owed as much as a year's worth of annual leave. 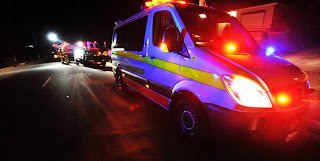 Documents obtained by the Mercury this week show that ambulance officers, along with doctors and nurses, are in such short supply they cannot take their accumulated holidays. A volunteer officer said yesterday that some staff were being paid overtime rates to work during their holidays to cover for staff shortages. He also cited volunteer workers having to work up to 20 hours and not having their uniforms replaced. "We are doing the same work as the career officers but feel like we are just treated like second-class citizens," said the volunteer, who did not want to be identified. "The day you go to work and bring someone back to life or deliver a bub, it makes it all worth it, but we can't continue to be ignored by management for much longer or we're going to crack." Ambulance Tasmania chief executive officer Dominic Morgan and Health Minister Michelle O'Byrne have urged ambulance officers and the Tasmanian community to be patient. Mr Morgan has admitted things are not perfect but is confident that when a raft of initiatives is introduced they will make a difference. But Liberal health spokesman Jeremy Rockliff said yesterday the program to help fix the sick ambulance service needed to be sped up. "The State Government has supposedly re-injected millions into the Budget to secure front-line health services but you can't get any more front-line than ambulance services, so when staffing is stretched so tight why isn't the Government actively recruiting more ambulance officers to fill the gaps?" he said. Mark over at 999medic.com has pulled up stumps. It was not a decision he took lightly and was forced into this decision by people causing problems for him. "I know I have people in my own service who actively look for things to get me into trouble. I now know I have people in my own service who have tried to cause trouble for me and this blog". In the last 18 months, his blog grew into one of the best EMS related blogs on the internet and one of my favourites. He had written and published 483 posts. Received over 3000 comments and the site had 250,000+ hits. He further created ‘The Handover’ EMS Blog carnival which is still going strong as the only EMS related carnival. I heard this the other day from an interstate friend who is a nurse and I laughed so hard I had to share it. This is true. I have not made this up. Several months ago, my friend was working on the triage desk at the Accident & Emergency department of the local hospital when a young mother came to the counter with her daughter in a pram. The mother was concerned about the health of her young daughter. Presenting history, past history, medications and allergies were obtained and then came the time to get the child's name. Nurse " what is you daughter first name"
Nurse "Sorry I didn't quite get that"
Nurse - with a look of confusion "Oh, how do you spell that"
Mother - with a look of disbelief/disdain "A B C D E"
Nurse - withholding a look of 'you have to be kidding' "Right"
Well, 7 months on the fixed wing has come to an end. I've consolidated my new found skills and knowledge, so I'm back on road next block so the other flight paramedics get a stint on the plane. The roster is only ever 4 weeks in advance but I'd take a guess and say I'll be on the road for several months before getting back on the plane as the plan is to continually rotate the ICFP's around. With Tassie being such a small state, I felt I just couldn't post about jobs without someone recognising themselves or someone they knew.